We have geared our portfolio towards the growth segments of our industry. It is based on equipment, service and consumables. Services and consumables together account for around half of total Group sales. Within our portfolio we are continuing to expand the growth segments of packaging, digital and services through partnerships as well. On the one hand, the priority is to integrate and automate customers’ entire value chains and thereby to enhance the competitiveness of print shops. Also, system operations will be both increasingly smart and autonomous in the future with the right services. 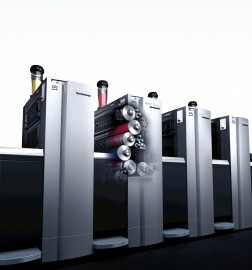 On the other hand, new digital printing offerings target customers’ expanded business models. Our products, service offerings and consumables, in addition to our partnerships, are tailored to meet specific future-oriented customer needs and are geared towards our customers’ economic success. To achieve this we offer an all-round service with reliable presses and fully integrated solutions with the right services and consumables, which guarantee the utmost availability of all means of production and a smooth-running, continuous production process. The range extends from state-of-the-art digital technologies to preconfigured standard offset presses with corresponding cost benefits and fast delivery times, through to individually configured special presses for maximum productivity and every conceivable print application. We also support our customers by offering suitable financing concepts for their investment projects. In South Africa we have a direct and significant investment in the Southern African market that is increasing all the time. With our branch offices in Johannesburg, Cape Town and Durban, we are also directly responsible for sales and service in the following SADC countries: Botswana, Lesotho, Malawi, Mozambique, Namibia, Swaziland, Zambia and Zimbabwe. To conclude, Heidelberg is a customer focused organisation that strives to be an all-round service provider covering the entire value chain from business consultancy, placements of technical solutions to servicing of installed equipment and systems, both locally and globally. The company has been a continuous member of Printing SA (previously known as Printing Industries Federation of South Africa) and is also actively involved in giving back to the printing community.